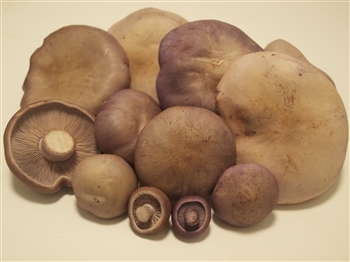 The blue foot, or blewit, is a gilled mushroom that is cultivated, but can also be found in the wild. Their beautiful deep blue color makes them easily distinguishable, and when sautéed becomes a vibrant blue or purple. The flavor of the blue foot is very strong, yet has subtle earthy, woodsy undertones. Its firm yet velvety texture is wonderful in pastas, risottos, and pairs well with proteins. Blue foot mushrooms must be cooked through, and never eaten raw.